Increasing your F&I Profit with Leading F&I System, Finance Accelerator. Pentana Solutions is a proud partner of the leading F&I Performance Management System in Australia, Finance Accelerator. Two heads are smarter than one and the possibilities are limitless - with both companies working together to bring you greater profits. Take these two case studies. F&I saleswoman, Carol, has 5 years’ experience in selling Finance & Insurance. She has worked in both the banking and automotive industry and is always a top achiever in selling rate. However, she’s not great at selling insurance, her reason being that it takes too long to get a quote. Does this sound like you? Or maybe you relate more to David. With over 10 years’ experience in F&I, David is always looking for more opportunities to increase his business. He’s not computer savvy, hates filling out reports and is skeptical that software could increase his IPRU (Income Per Retail Unit). On top of that, he manages a diverse team located in different places. Then came Finance Accelerator: Australia’s leading F&I Performance Management System. Since implementing, Carol no longer misses a deal because all deals are fed through to her via her DMS and insurance sales have doubled, increasing IPRU (Income Per Retail Unit) almost by 100%. David increased his finance penetration from 50% to 63% and IPRU has increased $1347 to $3074. Benefits from Finance Accelerator include surges in profit, a massive saving in time and resources, and the ability to analyse your F&I side of the business. The frustration of having to manually reconcile commission or calculate income to generate reports is a way of the past. And if you need to manage a team from multiple locations - that’s no longer a problem either with Finance Accelerator. The best part is - Finance Accelerator integrates with Pentana Solutions’ ERAnet so your data seamlessly flows from one to the other. No more double entries as Finance Accelerator complements Pentana Solutions’ ERAnet perfectly. This also means you can stop chasing deals from the sales team because every time a sale is captured in ERAnet, it is automatically populated in Finance Accelerator. You won’t miss an outside deal or need to wait for rego details before engaging with a customer. 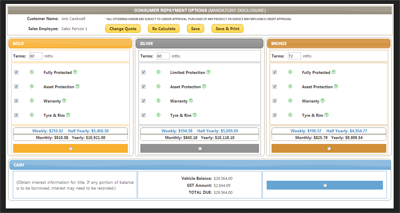 The F&I menu above is a prime example of how Finance Accelerator can help your dealership. By providing your customer with a complete presentation of F&I products, you’re able to increase profitability, insurance penetration and customer satisfaction. Show your customers what they want and help them make the right decision - with clear, easy to read options - while always holding confidence that the represented data is accurate, because it integrates in real-time. After you’ve boosted your opportunity during sales, analyse the outcome and prepare for next time. With Finance Accelerator you’re able to see what customers bought - where and why - so you’re able to implement changes to stay competitive. The clarity within your F&I department will have never been so clear. From the insight you’re giving to your customers, to the insight you’re gaining from aftermath analytics - Finance Accelerator works together with Pentana Solutions to revolutionise your dealerships’ F&I department. Contact us here to read more! *Case Studies and Photo Provided by Finance Accelerator.